We are a live entertainment agency with a small collection of amazing shows. 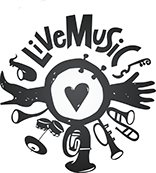 We try and promote live music when ever we can and every act that has our live music crest (on the right) is completely live. Have a look at our entertainment roster and if you are interested in booking any of our shows give us a ring or fill in our quick online enquiry form which is at the bottom of every page. Impeccable was started to supply you with the very best entertainment for your wedding, event or live music venue. Every one of our shows have gone through months of rehearsals and road testing. All our performers are professional musicians/singers and they all have Public Liability Insurance. All the shows come with a State of the art PA system and Light show, and all the equipment is PAT tested and meets all legal requirements.